One of the most important elements of chipping is the ability to control distance. And this ability only comes through having a chipping action that is completely reliable and repeatable. 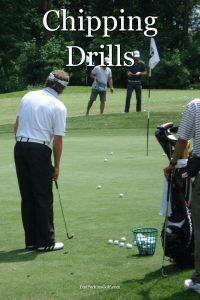 Here are a few golf chipping drills you can use to hone your action. This first drill will make sure you’re not putting too much wrist motion into your chipping swing. Take your normal stance while holding your club but then move your hands down to the bottom of it, near the club head, while maintaining your normal grip and stance. That is in your normal stance grip your club near the bottom. Your club shaft should then go past your left hip if you’re right-handed, or your right hip if you’re left-handed. Take a backswing and follow through with your swing. The aim is to do this without the club shaft hitting your hip, which is what will happen if you release your wrists too much. Keep repeating this swing action, making sure the club shaft never hits your hip, until you’ve got it in a groove. When chipping, it’s important to make sure that your hands lead the club face. One good way to force your hands to lead is to practice chipping by placing the ball back in your stance, even behind you. When the ball’s positioned here, it’s not possible for the club face to lead your hands. Keep practicing like this so that you get used to your hands leading and it becomes completely natural for you. This is a great chipping drill to practice hitting the same spot every time and so increase your accuracy and consistency, as well as your distance control. Place three of your club head covers on the practice green, about six feet from the edge. Then move back away from the green until you’re about twenty feet or so away from the head covers. Drop some balls here. Take your sand wedge and hit some chip shots while trying to land the ball where the covers are, so that it rolls up towards the flag. If the ball doesn’t roll far enough, don’t start trying to hit the ball further, beyond the covers. Instead, take out your next club, for example your pitching wedge, and start using this instead. Again, you’re trying to land the ball by your covers (that are about six feet past the fringe of the green), and roll the ball up to the hole. If you’re chip shots still aren’t reaching, then take out your next club up, for example your nine iron, and try that instead. Once you start landing the ball by the covers and the ball rolls up close to the hole, then you know that’s the right club you should be using for this type of chip. You can contine to practice your chipping from here using that club, or you can then move to a different distance and then repeat the same exercise. These golf chipping drills will help you to master the swing, accuracy and distance control you need to be a reliable chipper around the green.